Use timetotrade to execute trades, or notify you, when the Price tests or breaks through your Support and Resistance Trend Lines. You can set up alerts that will execute trades if the price closes below a Support level on varying intervals; if the Price touches a Trend Line with the alert checked on each tick; if the RSI breaks out of an upward or downward trend; if the High Price breaks through a Resistance Trend Line however the Close Price closes below the Trend Line; create multi-condition alerts that will execute trades for example if the Price touches a Trend Line followed by a change of Trend on the MACD. 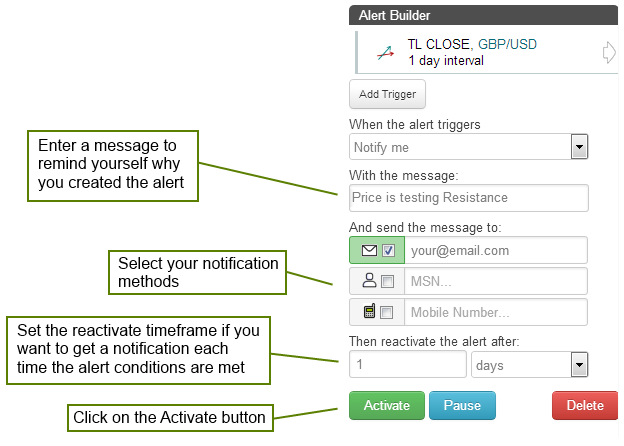 After creating your alerts, you can then quickly backtest your alert based trading strategies. 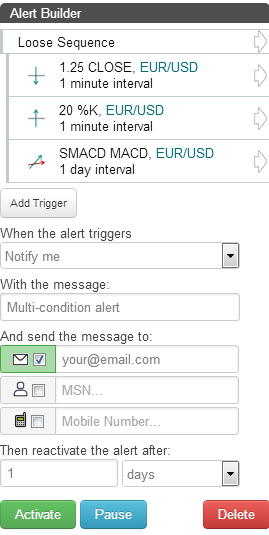 You can even build compound multi-condition alerts which will be triggered if a series of events occurs, for example you could create an alert on a stock that will trigger if: the MACD rises above zero and then crosses over; or the stochastic rises above 80 and the MACD falls below the smoothed MACD; or the RSI of a stock was to fall below 70, followed by a price breaking a Support Trend Line and a stochastic crossover. 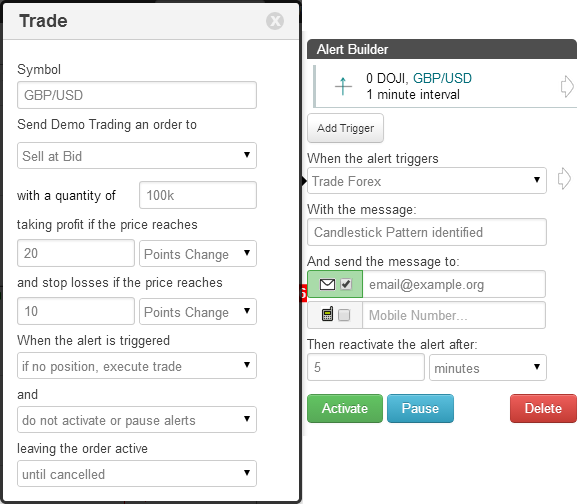 To create an alert, go to the timetotrade CHARTS page and enter the ticker symbol for the stock or currency pair that you wish to use. This will take you to the chart alert creation page. 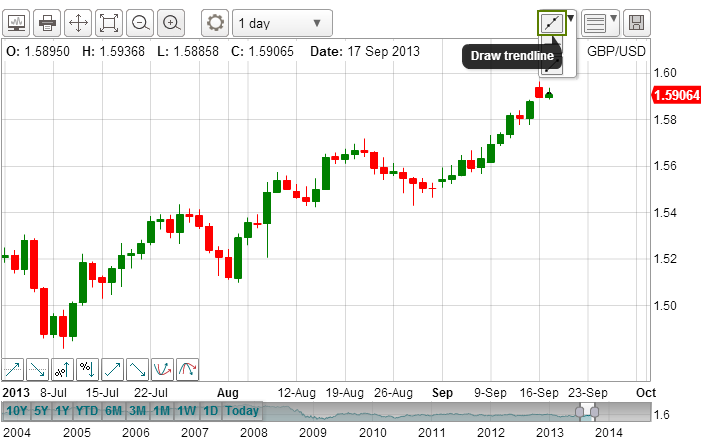 Once you have set up your own timetotrade account you can customise your own chart preferences using the chart settings. 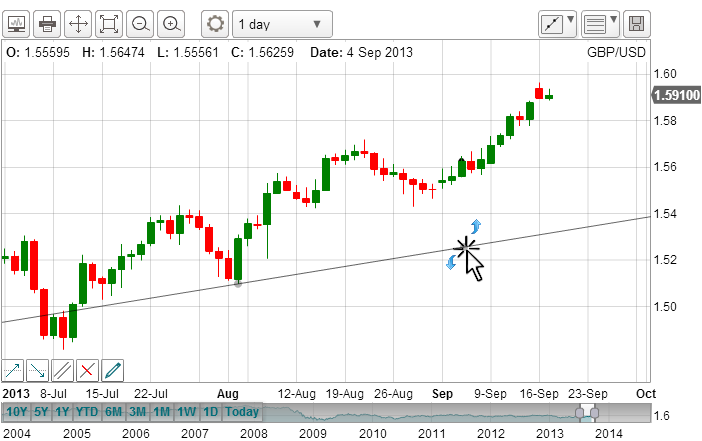 Position your mouse cursor on the chart where you would like the Trend Line to begin and left click your mouse button. Holding down the button, manoeuvre the line until you are happy with the alignment and then let go of the button. 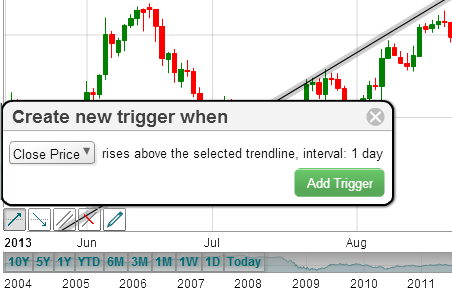 You can continue to draw additional trend lines, or click the "draw trendline" button again to stop. keeping your mouse button held down, move the Trend Line to where you want it to go and then release the mouse. 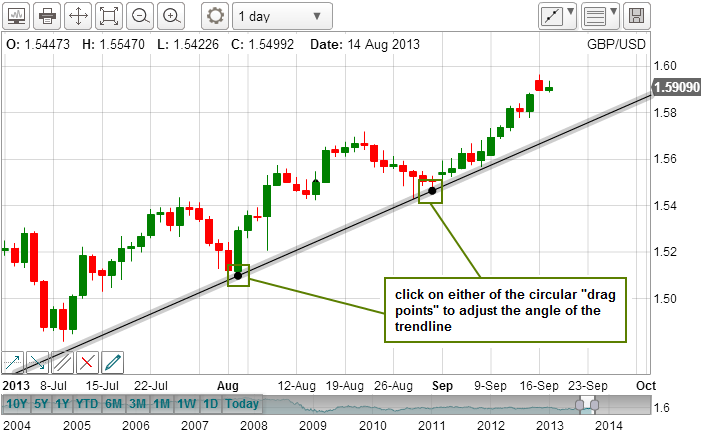 To learn more about how to draw and manage Trend Lines such as change the colour or create parallel lines, click here. On the lower left hand side of the price chart are a set of "Alert Trigger" buttons. 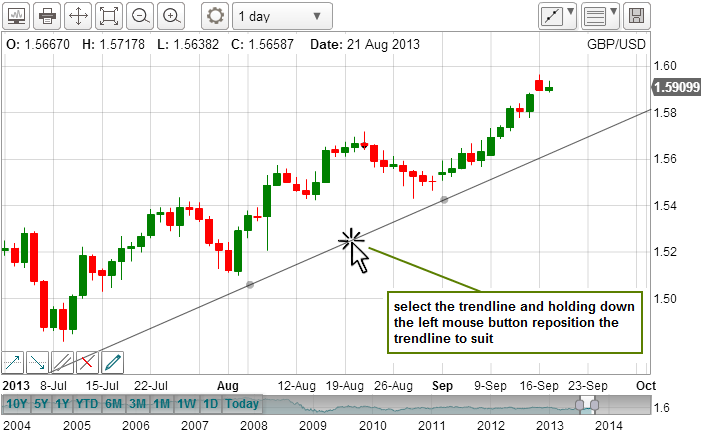 To create a Trend Line alert, click on a Trend Line to select it, then click on the appropriate trigger button at the bottom left hand side of the price chart. There are no programming languages to learn, no spreadsheets or complex formulas to write. Just click an alert trigger button and activate your alert. 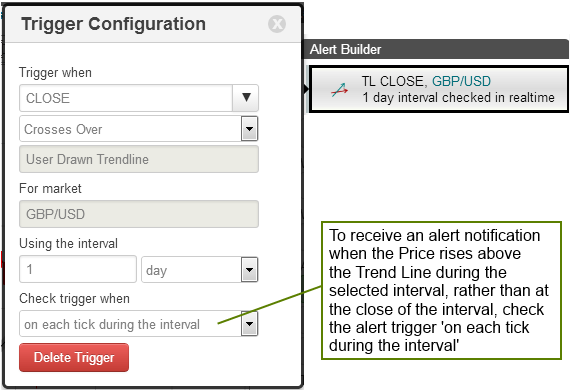 You can also create alerts if the Price is Above or Below a Trend Line using the Alert Builder. For information on the the other price alert types, please refer to the Stock & Forex Price Alerts tutorial. 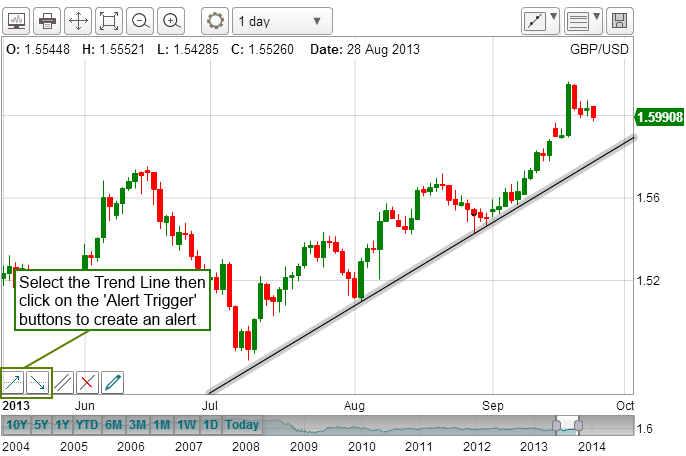 The next time the price closes above the trend line, you will receive an alert to your email or mobile phone. and repeat the steps discussed in the previous example. 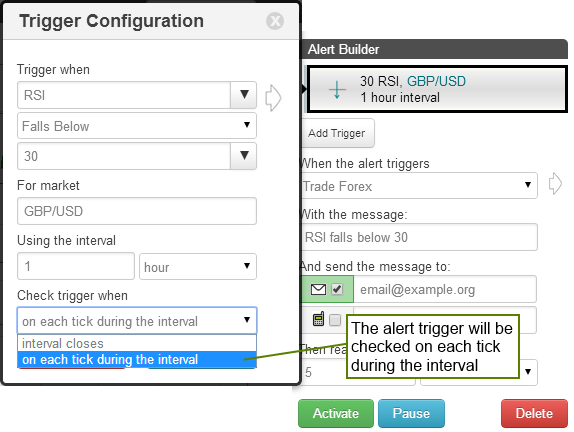 Alerts can be set up to execute a trade or provide a notification at the end of an interval or if the alert trigger conditions are met during the interval. 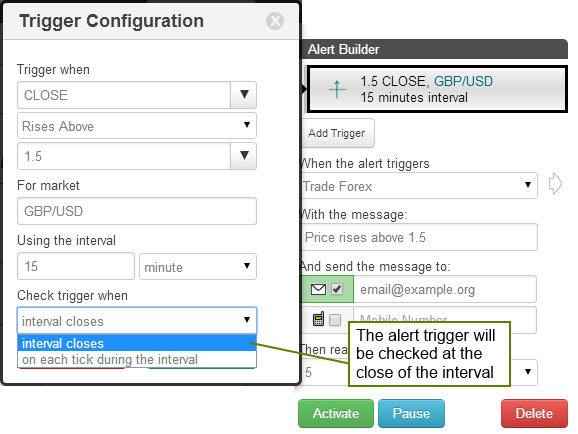 When creating alerts, set the 'Check trigger when' field to 'interval closes' or 'on each tick during the interval' to change the behaviour.